quite a bit ahead of PST. I have a few plans for lunch and then dinner and a movie, which I'm feeling quite excited about. In addition to those plans I also have a fun trip to the wonderful land know as Disney. A few friends/coworkers and I are driving there and staying the night. This means I must choose from my many makeup options what to pic for an over-night trip. Think, think, think, to quote a bear named Pooh. I have made a game plan to pack as little as possible. To start with I decided I would pack as many products that didn't require application with a brush as I could, things that could be easily blended and didn't require much fuss. Nars Pure Radiant Tinted Moisturizer ( in Terre Neuve Light0) was a clear choice as it applies beautifully with the hands and offers a nice light, healthy looking coverage. Benefit Erase Paste (in 1 Light)was my next choice since I already apply this with my fingers and not a brush. Tarte Cheek Stain (in Flush) is my new go to for spring as orchid cheeks have been declared thee color for spring/summer. This applies best from the packaging and blended in with a patting motion with the fingers. Benefit Watts Up was the next thing I reached for that kept in line with using my fingers. Urban Decay Naked 3 was my pick for eye makeup as it is not too bulky in packaging, has a nice offering of look options and is locked and loaded with a brush included. Too Faced Snow Bunny broke my rule...what can I say...I'm a rebel. But I justified it by the fact that I could use the white as an inner corner and brow highlight since Naked 3 offers no shimmery highlight shade and a touch of bronze is nice as it's warming up. 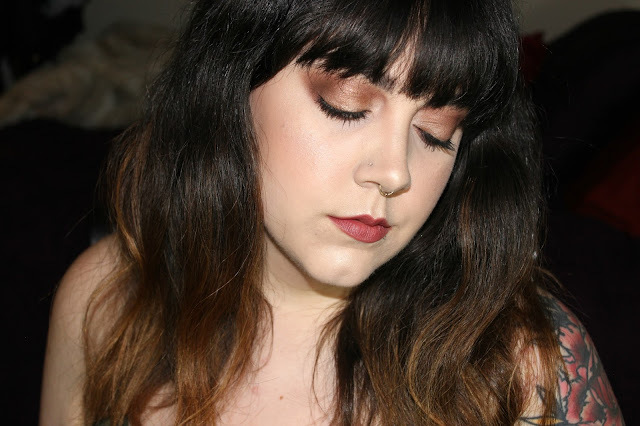 Tarte Smooth Operator Amazonian Clay Finishing Powder along with Watts Up! are sample sizes perfect for travel as they take up little space. This I had to bring since Erase Paste can crease under the eyes when not lightly set. Real Techniques Kabuki Brush was the ideal choice for it's compact size and versatility in that it opens up and can be used on different planes of the face. Benefit They're Real is my mascara of choice because it can be buildable and also can be worn quite natural with long staying power that doesn't ever feel heavy on the lashes, which is important since I have a 4 hour drive home.